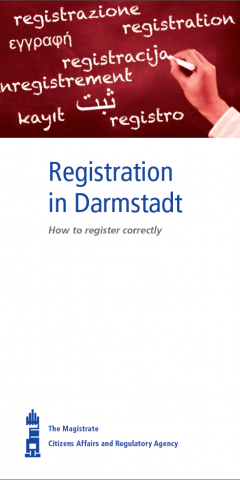 The following information will help you, when you have just arrived in Darmstadt. You can get information about your visa and the next steps you should take. What do I have to do, once I get here? Within 7 days after your entry, you have to register at the residents’ registration office. If you live in one of the surrounding communities, or rural districts you will have to register with the residents’ registration office of your place of residence. The registration at your place of residence is important in order for you to get an appointment with the immigration office (Ausländerbehörde – ABH), which is send via letter. For that reason, you have to register with the resident’s registration office every time you change accommodation. You need a so called “Wohnungsgeberbestätigung“ as proof of living at a specific address. You will find the form online and it has to be filled out by your landlord. If you do not have an accommodation so far, the residents’ registration and the immigration office also accept a “Wohnungsgeberbestätigung” from hotels or hostels, for a short period of time. At the registration you will get the confirmation of registration. Keep it safe, as it is often required for formalities. Please be aware: Without accommodation, no registration at the residents’ registration office; without registration, no appointment at the immigration office; without appointment at the immigration office, no residence permit; without residence permit, no work permit. Further information about each topic can be found below. You have to pay the semester fee before the enrolment. (Therefore, please consider the semester dates and re-registration period of your university). You can either deposit the amount at a bank (chargeable) or transfer it from a bank account. You will find the necessary information regarding semester fees in your approval document. Do not transfer money from your home country, without looking at the specifics, as it can be expensive and often takes time. You need a bank account with a bank active in Germany (giro account). If you have not opened a bank account for Germany from your home country yet, you should do so immediately. This is very important, because without a bank account, you cannot open a blocked account and you cannot transfer the semester fee, as well as other important payments (e.g. rent). Many banks offer accounts without any fees for students. ATMs (withdrawing cash): Some banks do not offer many ATMs and finding one without having to pay a fee can be time consuming. Therefore, informing yourself about ATMs and how many there are for a specific bank is strongly advised. That is why some banks are cooperating with supermarkets and petrol stations, which can be used to withdraw cash. Most banks have a tool to check closeby ATMs and supermarkets where you can withdraw cash (it is often called “Geldautomatensuche”). Be careful with charges for overdrawing. When overdrawing the “giro account” you will often be charged up to 13 %. Withdrawing money at ATMs, which do not belong to your bank, often costs a fee of several Euros. Be careful, when banks offer overdraft credits. These often have high interest rates. To open a bank account you need the following documents: passport, approval document (you will get this from your university), confirmation of registration (you will get this at the residents’ registration). It is recommended to establish a standing order or to allow a direct debit for regular payments (e.g. rent, health insurance fee, phone, etc.). Why do I need health insurance? What is important? A valid health insurance coverage is required for the enrolment! There are compulsory and private health insurances. A compulsory health insurance is advisable. Usually this costs about 80 € per month (for students younger than 30). Well-known compulsory health insurances are for example: Techniker Krankenkasse, Barmer, DAK, AOK or IKK. Attention: private health insurances often require you to pay medical benefits and medicine in advance. Besides not all private health insurances are accepted by the immigration office (the coverage needs to fulfill certain criteria). Health insurance that is cheap, but does not have the required coverage is of no use to you. In case you already have a health insurance, you should check whether it covers all medical procedures, the immigration requires. A travel insurance does not apply. Consider the deadlines and addresses in your approval document. Usually, the following documents are needed for the enrolment: passport, approval document, proof of health insurance coverage, payment of the semester fee. If further documents are needed, it will be written in your approval document. Non-EU citizens with visa requirement: they have to apply for a residence permit within the validity of the entry visa (3 months). Non-EU citizens without visa requirement (e.g. Japan, USA, Canada): The residence permit has to be applied for within 3 months after entry, if the stay is planned for more than 3 months. Responsible for granting a residence permit is the immigration office of the district you are living in (the place of study is irrelevant). Register as soon as possible at the residents’ registration. Do not wait until the immigration office learns of your arrival in Germany. In general, an appointment for getting a residence permit should be sent to you within one month after the registration at the residents’ registration. However, for various reasons that appointment might not be sent inside of one month. If you did not receive a notifi-cation for an appointment inside of one month, you should actively ask for an appointment and not wait until you receive a notification! The language used during the interviews at the immigration office is German (for legal reasons). If this is (still) difficult for you, you are allowed to take a person with you, who translates for you. Phone calls to your home country can be expensive and getting internet access is vital to get information and orientation in Darmstadt and for your studies. If you are uncertain about the choice of provider or contract, you can get support from our comeTOgether tutors or social counselling. In Germany free Wi-Fi is not available everywhere. However, as a student you have the possibility to get free access to the Wi-Fi networks of the TU or h_da.